I'd posted back in June about opportunities and approaches in pairing between mobile devices as smart phones and tablets proliferate. ncubeeight has teamed up with ViSSee computer vision of Switzerland to create a new US joint venture, Air-Wire, to develop paired-device infrastructure tools for game developers interested in creating more robust and immersive gaming experiences. Through the iPhone App Store, Apple has re-invented and expanded the shareware model of the 1990s. But whereas shareware depended on free software to all with a small percentage of customers contributing toward the development costs, Apple's App Store permitted a more lucrative model, where every customer chips in a little bit, creating a boom in scalability for the independent developer community. Now that many consumers have multiple smart devices (iPhone, iPad, Macintosh Computer, AppleTV) in their household, new multiple device interaction can be used by one consumer through wireless pairing of devices used in a single task. The benefit of the ViSSee computer vision tools is that a mobile phone is now able to capture gestures beyond touch through input from the embedded camera, interpreted by the native device CPU. (central processing unit) Air-Wire's products will permit an iPhone to be used as a joy-stick or input mechanism for a game running on a separate device, be it another iPhone, iPad, Computer, TV or utility-connected device. Microsoft Kinect and Nintendo Wii have have pioneered infrared-based peripherals for remote input tracking to replace the mouse, trackball or stylus (which were abstracted controls for gaming computers) with more intuitive body movement tracking based on natural body motion. Now that many "smart devices" such as mobile phones contain both a camera and CPU of their own, they can render intelligible messages to a remote computer as preprocessed input commands without needing the infrared. 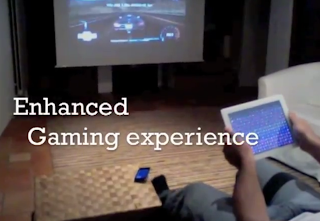 Air-Wire's infrastructure tools will, for example, permit driving games to detect foot position for input commands such as braking and accelerating that the player uses to control the tablet-hosted game while using the tablet itself as a steering wheel, in turn projecting the screen of the game play through Apple's Air Play to an external screen. As device-pairing opportunities expand with the distribution of tablet, mobile, and clothing accessory remote chips like the Jawbone "UP" wristband, more market opportunities open up for developers. And we'll have more to show you.